FALMOUTH, Massachusetts, January 26, 2011 (ENS) – Chemical dispersants that BP injected directly into its damaged wellhead in the Gulf of Mexico last year, had still not degraded three months after they were applied, according to the first peer-reviewed research on the fate of the chemicals, published today. In the effort to manage the massive Deepwater Horizon oil spill, BP injected some 771,000 gallons of the chemical dispersant Corexit 9500 a mile beneath the surface of the Gulf of Mexico. 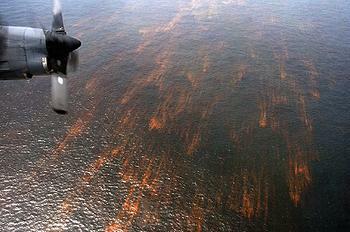 Dispersants function like detergents to break up oil into small droplets that mix easily with water. Today, Woods Hole Oceanographic Institution chemist Elizabeth Kujawinski and her colleagues reported that a major component of the dispersant was contained within an oil and gas-laden plume in the deep ocean and had still not degraded three months after it was applied. The study, which appeared online today in the American Chemical Society journal “Environmental Science & Technology,” is the first peer-reviewed research to be published on the dispersant applied to the Gulf spill and the first data on deep application of a dispersant, according to ACS and Kujawinski. Previous studies had indicated that dispersants applied to surface oil spills can help prevent surface slicks from endangering marshes and coastlines. Still, she said, the results warrant toxicity studies into the effects of the dispersant on corals and deepwater fish such as tuna. The EPA and others have already begun or are planning such research, she said. “The results indicate that an important component of the chemical dispersant injected into the oil in the deep ocean remained there, and resisted rapid biodegradation,” said Valentine, whose team collected the samples for Kujawinski’s laboratory analysis. Kujawinski and her colleagues found one of the dispersant’s key components, called DOSS (dioctyl sodium sulfosuccinate), was present in May and June, in parts-per-million concentrations, in the plume from the spill more than 3,000 feet deep. The plume carried its mixture of oil, natural gas and dispersant in a southwest direction, and DOSS was detected there at parts-per-billion concentrations in September. 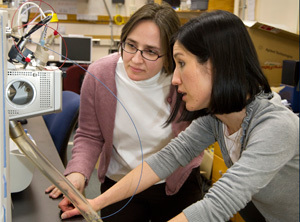 Using a new, highly sensitive chromatographic technique that she and WHOI colleague Melissa Kido Soule developed, Kujawinski reports those concentrations of DOSS indicate that little or no biodegradation of the dispersant substance had occurred. The deep-water levels suggested any decrease in the compound could be attributed to normal, predictable dilution. They found further evidence that the substance did not mix with the 1.4 million gallons of dispersant applied at the ocean surface and appeared to have become trapped in deepwater plumes of oil and natural gas reported previously by other WHOI scientists and members of this research team. The team also found a striking relationship between DOSS levels and levels of methane, which further supports their assertion that DOSS became trapped in the subsurface. The use of dispersants in the aftermath of the Deepwater Horizon explosion on April 20, 2010 was controversial for three reasons. First, the total amount of dispersants used was unprecedented – 1.84 million gallons. Second, 771,000 of those gallons were applied at the wellhead, located 5,067 feet below the surface. Little or no prior testing had been done on the effectiveness and potential adverse environmental consequences of subsea dispersant use, and never at those volumes. Third, the existing federal regulatory system pre-authorized dispersant use in the Gulf of Mexico without limits or guidelines as to amounts or duration. Kujawinski cautioned that “we can’t be alarmist” about the possible implications of the lingering dispersant. Concentrations considered “toxic” are at least 1,000 times greater than those her team observed. In Kujawinski’s technique, the target molecule was extracted from water samples with a cartridge that isolates the DOSS molecule. The scientists observed the molecule through a mass spectrometer, calculating its concentration levels in the oil and gas plume. This method is 1,000 times more sensitive than that used by the EPA and could be used to monitor this molecule for longer time periods over longer distances from the wellhead, Kujawinski said. “With this method, we were able to tell how much was there and where it went,” she said. 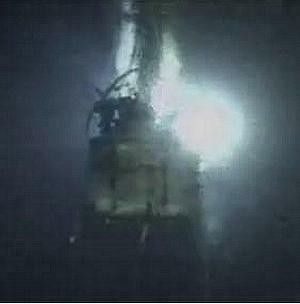 The scientists detected DOSS up to 200 miles from the wellhead three months after the dispersant injection took place, indicating the mixture was not biodegrading rapidly. Kujawinski and Valentine were joined in the study by Soule and Krista Longnecker of Woods Hole Oceanographic Institution, Angela Boysen a summer student at WHOI, and Molly Redmond of UC Santa Barbara. The work was funded by WHOI and the National Science Foundation. The instrumentation was funded by the National Science Foundation and the Gordon and Betty Moore Foundation.